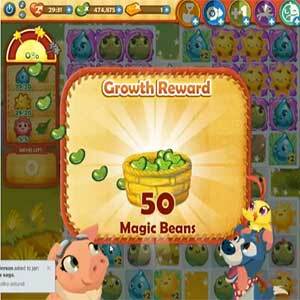 These Farm Heroes level 158 cheats and tips will help you beat level 158 of Farm Heroes. 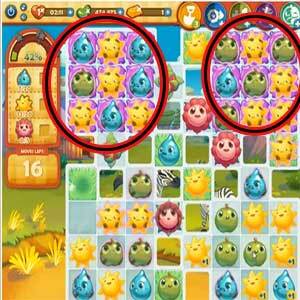 The objective of Farm Heroes level 158 is to collect 20 droplets, 20 suns, and 5 flowers in 20 moves. Since there is no way to get rid of the actual grumpification tiles on the level, because there’s no way to make grass, you need to collect the ingredients by working from the bottom to the top. The flowers will hold the majority of the grumpy cropsies in place on the top of the screen. Focus on the non-flower ingredients you need first to pass the level. Make matches in chains of 4 to 6 cropsies to facilitate the collection process. Chain cropsy combinations have the added bonus of scattering +1 point values across the board. You should make chain moves whenever you can! 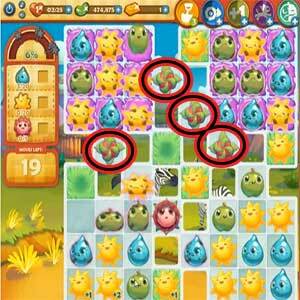 The easiest way to clear the flowers is to focus all of your moves away from clearing the grumpy slime and using them mainly for removing flower blockers. Grumpy cropsies will not yield any points towards helping the player meet the level objectives for Farm Heroes Saga level 158. However, they work just as well as regular cropsies for unwrapping flowers. Use them for this purpose. You can also utilize the magic shovel to clear flowers. Although these boosters regenerate over time, they are still very helpful in the game. Carefully consider moves that will cost you a shovel booster. The bottom of the board is the only area safe from grumpiness on Farm Heroes Saga level 158. With grumpy cropsies blanketing the top of the level, it will be difficult to form matches that aren’t reinforced by the occasional grumpy cropsy. Cascades are useless on this level because of all of the grumpification squares. Do not count on luck to help you win out the game. Try to get rid of the grumpy cropsies in groups. Matching their ilk with standard cropsies will compromise the point value of the whole match. Matching 3 worthless cropsies is a far better solution than ruining two that could potentially bring points towards beating the level. At the end of the level when you have collected all your ingredients you will receive 50 additional magical beans along with 100% growth.